Our 60ml bottle provides the best value. The cost per serving is cheaper. Download our third party lab results here. Hemp Extract Oil is a nutritional supplement extracted from USDA Organic, Colorado-grown hemp. Take one to two droppers of Hemp Daddy’s flavorless hemp extract oil daily to enjoy a happier, healthier life and enjoy many benefits. You may need to experiment to figure out the proper dosage you need. Start slow, and work up. Be sure to check out our blog post on dosing. Did my first order with Hemp Daddy’s. Heard about them on Ten Junk Miles. I ordered two bottles but only received one. Sent an email and got a quick response from Caleb. Sent me out a new immediately. I even got a note saying sorry for the mistake on the package slip. Great customer service! Shipped quickly. High quality oil. I am very happy. Fast service and shipping. CBD oil is great and priced right! I have bought this oil a couple of times. My dad is an elderly man with heart and lung issues. He has post herpatic nerve pain from shingles he had after his heart surgery 3 years ago. He is on gabapentin and and narcotics just to manage the pain. We are only a few weeks in and he has already decreased his use of narcotics and gabapentin. The CBD oil does not have any side effects although I think it’s helping him sleep. We will continue to monitor and decrease his gabapentin as he tolerates. I want his last fews years alive to be quality years and so far this has helped him tremendously. I use it to help me sleep and no longer take sleeping pills. 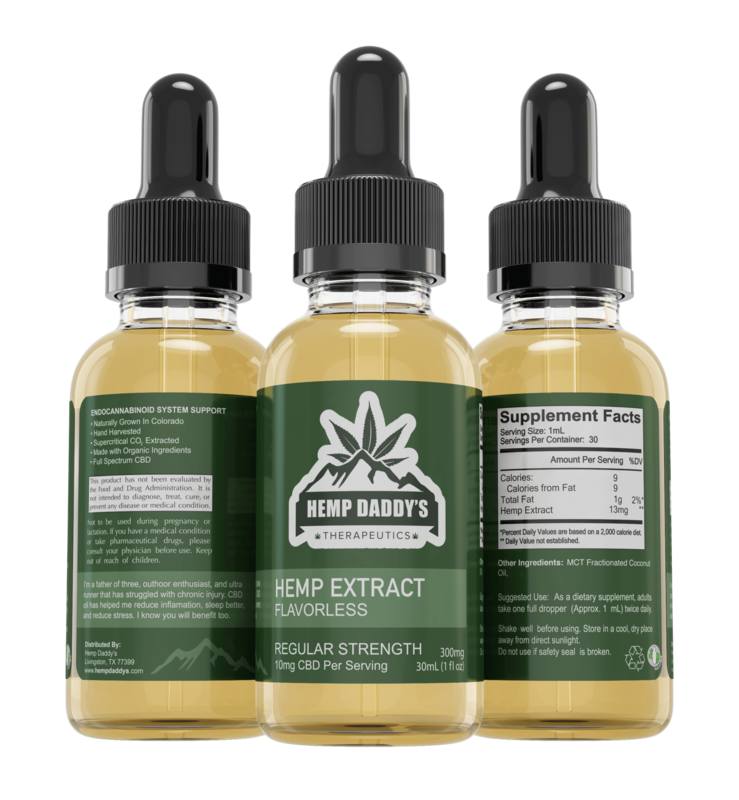 Finding the right CBD is important and Hemp Daddy’s was the best I found. I was not disappointed! Shipment was prompt and product is exactly as described on website. I have taken the oil for 2 weeks and It seems to help with falling asleep faster and I use it plus the pain cream to aid an IT Band injury in addition to RICE and physio. I don’t think this is a silver bullet, but like a lot of things in combination with other treatment it might actually speed up recovery. Price tag is still quite expensive, but I believe over time, the price for CBD will come down due to economy of scale. Can’t say I’ve seen any result after a week but product seems great thus far! Love it!! Using every day! Fast delivery. Quality product. Great results. I bought a bottle of extra strength hemp extract oil for my 80-year-old mother to try out, whom has joint pain, anxiety and sleeping problems. After using it for about two weeks, I noticed some improvement of her wellbeing. Her pain is still there but she seems to suffer less. She also seems calmer with a better demeanor. I obviously did not expect a miracle cure for her problems but this hemp oil seems helping. I will reserve judgement until my mother has a chance to use it for a few months. As a side note, cannabis products seem like a good alternate option for some medical treatments. I recall smoking pot in high school and in college but have not touched it for 25+ years. As an athlete nowadays, I just do not want to get high, as I recall pot used to make me very lazy. For this reason, I like to see this hemp extract oil with a higher THC content, enough for medical treatment, but not enough to get HIGH. Not sure if that can be done. Thanks for offering this product. A great resource for daily use. Helps with sleep and the every day anxieties. Excellent product that actually works!! Hard to hold under my tongue for absorption. Usually just about 10 seconds is all I can do before it’s overrun with saliva. You still get it into your system. Will just have a slower release into your system. 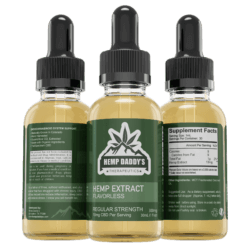 Hemp Daddy’s provides a top notch product. The online information on the website offers users important support. Tastes great. Have noticed improvements in all areas of life. I just had back surgery and can’t wait to get back to running ultras. Another benefit has been reduced anxiety. I have a lot of PTSD, anxiety, and depression challenges and running has been my solution until I couldn’t due to back surgery; this product is helping in the recovery. I won’t take over the counter medication due to all of the side effects and I’ve tried every under the counter option with negative results, so I’m really fortunate I have found this product. No issues, item was delivered within the time frame given. The mint flavor isn’t overwhelming, I would actually like it a bit stronger . Great product to use as a daily supplement to help with sleep, and recovery. My first time using it, so far my sleep has improved, minor little aches not yet. Think I’m going to try extra strength. Was a bit skeptical but heard good things on Ten Junk Miles podcast so I thought I would give it a whirl. I was impressed by how well I started sleeping even from the first try. I highly recommend this if you are like me and tend to toss and turn and are wakeful in the night. This is great flavor, and easy to ingest. Works wonderfully and the extra strength is worth every penny. Thank you guys for providing a product that I can trust. I’ve been mostly pain free since using this oil. Ordering was easy, delivery was quick. I use the product daily to aid overall recovery and reduce inflammation. Service was great. I’ve only used the oil for a couple of weeks. I purchased the unflavored and the taste is fine. The main reason for purchasing the oil was for anxiety . . . I believe it is helping. Great product. I feel like it really works for inflammation and I sleep great. The mint flavor is great. Just enough to feel refreshing but not overwhelming. Taste’s great. No after taste. Works as described. Very subtle. Eases body aches. Sleep better. Overall mood is better. No paranoia or high. Solid purchase. I have been very impressed with the quality of the product and have seen immediate improvement in my sleep patterns and in recovery from workouts. Great taste. Highly effective. I felt body pain relief within 4 hours of my first dose. Interested in increasing my potency next order.. I have really enjoyed using CBD oil. First, I like the flavor of the mint version. Second, I have noticed a decrease in my anxiety with one dose a day. And third, I notice my body just feels better after hard or long runs. I am a big advocate for CBD oil and think this company does a great job with their product and communication. First time I have tried hemp extract. After using it for a couple of weeks, I feel more relaxed and sleep better. Great product. Easy to follow instructions on bottle. Would highly recommend. Since I’ve been taking the oil I’m sleeping a lot better! And I take it with my coffee gives me energy. Can’t say for sure that my blood work results are better because of the oil! But it’s the only different thing that I’m doing between tests!! I am VERY happy with my Hemp Daddy’s. I started just about two weeks ago and noticed improvement in my elbow pain in about 4-5 days. I have been dealing with tennis elbow on both for over 5 months, and the pain is quite severe. I stopped taking Aleve and while there is still some pain, I can make it through the day without noticing too much. Hopefully the reduction in inflammation will allow it to finally heal. It’s great for recovery from running. Purchasing is very easy and convenient. I received my order quickly. Hemp Daddy’s website is a great resource for dosing, etc. I bought the mint-flavored, which is strong, but not unpleasant tasting. Since starting using the oil nightly, I feel the quality of my sleep has improved and my knee pain from patella-femoral chondromalacia is improving. This product really helped relieve inflammation in my tendons and sore joints. Amazing how well I sleep now, this product is awesome! This is the best CBD on the market! Going on bottle # 3 of Advanced strength and most of my inflammation is under control. My sleep pattern is much better. Overall pain in lower back, right foot, and right knee is getting less and less. I’m not saying that this CBD is working mericals but it sure is working! Just love the energy I have and the good sleep I finally get. Extremely happy with the product. It has helped me to sleep better, reduce stress, and has helped tremendously with chronic pain from running injuries, and a car accident from years ago. This stuff tastes way better than the CBD oil I got from BlueBird Botanicals. It also has a higher CBD content. I’ve been taking CBD oil for almost a month and have already seen marked results. I have fibromyalgia and with each week I’m needing and taking less and less of my fibro meds. It’s working, as well, for my anxiety (which is one of the unfortunate symptoms of fibro) and I’ve been able to reduce that med too. I’m very happy with the results I’m seeing and am looking forward to seeing even more. I recommend Hemp Daddy’s. 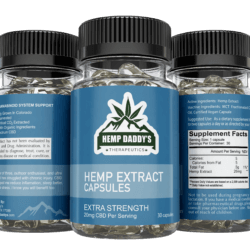 My anxiety has dramatically reduced and my sleep issues have gotten so much better since I started taking Hemp Daddy’s. It used to take me hours to fall asleep and now I’m out within the hour. It’s helped a ton with my chronic inflammation and joint pain also. I have had many sports injuries that never healed right including a ACL surgery that was not a complete success and this oil is no joke. Its is a legit product and their customer service is fantastic. I recommend it to my friends and family all the time and they’ve ordered it and are already seeing great results. My mother in law borrowed some of my oil for her hand and 24 hours later, her inflammation was still down and she was convinced and had me order her a bottle.